The Miller Preserve, a gift from Mr. and Mrs. Morris Miller, though small at 2.3 acres, is rich in both history and plant life. The history of the Miller Preserve, since the European arrival in the area, covers over 300 years. The land was associated with the “Welsh Tract” granted to a group of Welshman, by William Penn, who had received Pennsylvania from Charles II. 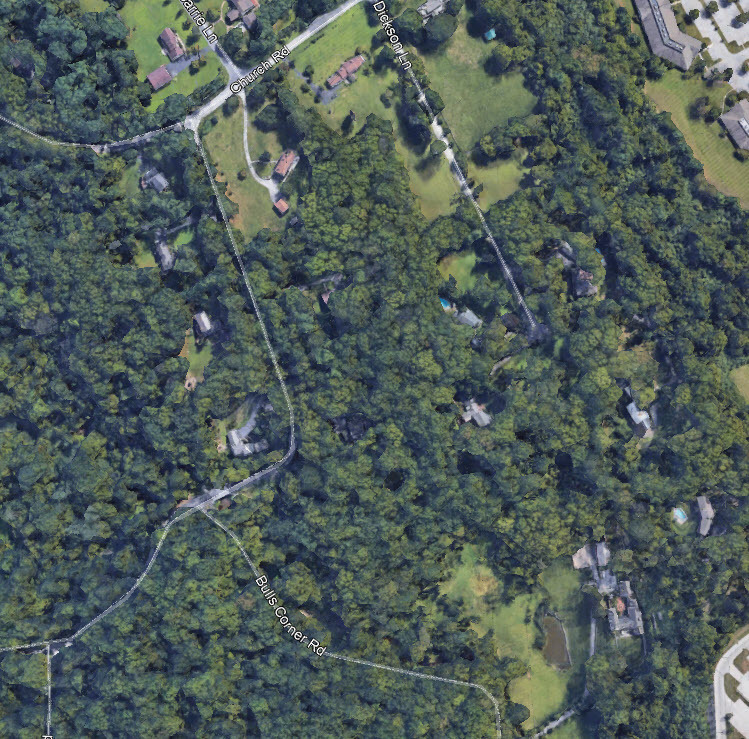 The original 40,000 acres did not extend as far North as Tredyffrin, but by 1686 the area had expanded to over 100,000 acres and included what is now the township and this OLC preserve. The Miller Preserve, south of Valley Creek and West of Church Road was the site of several mills. Around 1737 a fulling mill (wollen cloth making) was constructed by Samuel Lilly, sold to John Rowland and passed on at his death in 1745 to his wife Letitia. In the 1770s or early 1780s the use changed from a fulling mill to a grist mill (grinding corn and wheat). In 1798 the parcel was owned by Jonah Frances and occupied by William Jones. The property was noted as having a log house (now restored and standing on the east side of Church Road across from the Miller Preserve), a stone Grist Mill (St Peters Mill) and a stone stable. Breou’s farm map, published in 1883, shows that the mill was still in operation then as a saw and grist mill, owned by George Fetters. However, an 1897 map shows that the property was owned by Fetters’ estate, and by 1912 the property was owned by a Mrs.George H. Smith. It is said that in the 1920s the timbers of the mill were sold to Wharton Esherick who used them to build his studio on Diamond Rock Hill. Most of the Miller Preserve consists of grassy floodplain woods under an open canopy of black walnut. This area was the site of a project to grade the stream back and connect the creek with the floodplain. Native grasses, herbs, scrubs and trees were planted in 2008 and some of these persist. River-rye, showy tick-trefoil, ox-eye, and golden alexanders were noted along the inner edge of the floodplain. The most notable area of the Miller Preserve is the narrow steep ridge in the extreme south, jutting almost into Valley Creek. Here, along the east slope and at the base of the tip, is a small sampling of the original woodland flora of the area, including miterwort, basswood, wild gooseberry, a fallen but still living hop-hornbeam, the fern blunt-lobed woodsia and several clumps of wild columbine. The Miller Preserve and Cedar Hollow Preserve now appear as one contiguous property but have distinct provenance. 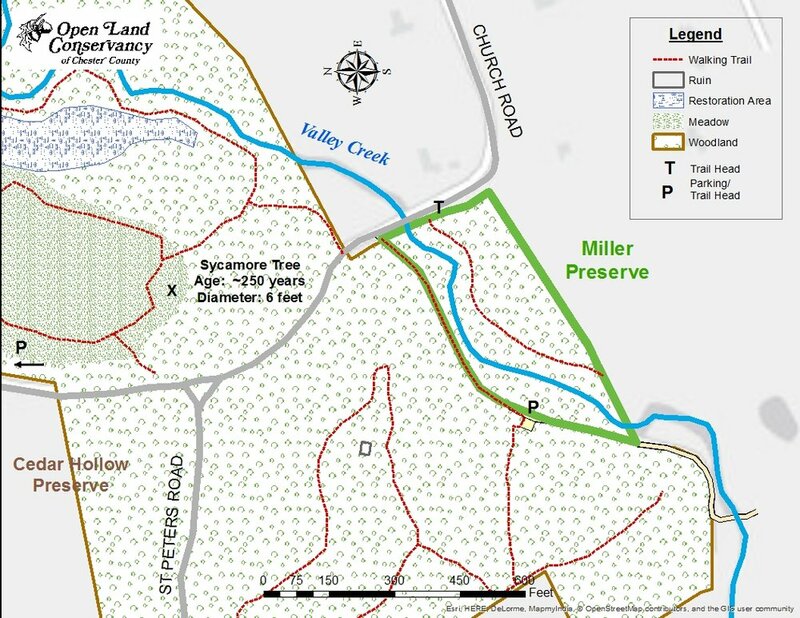 Open Land Conservancy acquired the Miller Preserve as a gift by Mr. and Mrs. Morris Miller (no relation to the donors on page 1) , while Cedar Hollow Preserve started in 1999 with the acquisition of approximately 60 acres funded with grants from Chester County and the Commonwealth of Pennsylvania under the “Growing Greener” program. Miller Preserve offers the public many forms of passive recreation, such as bird watching and trout fishing. Another Open Land Conservancy focus is working with youth groups on environmental projects, such as tree planting and removal of invasive species to cub scouts picking trash off the floodplain. In fact, the Miller Preserve has been the beneficiary of two major scout group tree planting projects: the trees in the tubes on the creek banks were planted by girl scouts, the trees in the exclosures further inland were planted by boy scouts. Both installations are thriving and adding to Preserve diversity. Miller Preserve is there for our community to enjoy.